Amy Shojai, CABC, is a former writer for The Spruce for several years. She has been writing about cats (and dogs) for more than 25 years. She has won dozens of awards for her books, articles, and broadcast appearances. Her work empowers pet lovers by turning "medicalese" into understandable information they need to make informed decisions for their beloved companion pets. 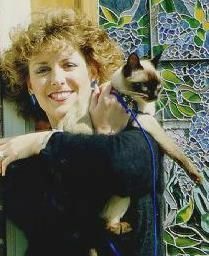 Amy is a certified member of the International Association of Animal Behavior Consultants, founder and president emeritus of the Cat Writers’ Association, and a member/volunteer with several other animal welfare and writing organizations. She is a spokesperson for the pet product industry and a sought-after keynote speaker and lecturer at conferences around the country. She has been featured as a pet care specialist in The New York Times, Reader’s Digest, Woman’s Day, Family Circle, Woman’s World, and other leading newspapers and magazines. She regularly appears on national radio and television as an expert, including CNN, Animal Planet, Cats 101, Dogs 101, and The Today Show. Amy routinely attends veterinary conferences and behavior seminars, and also regularly interviews other experts to keep her knowledge current. Why Is My Cat Rubbing Her Head on Everything? Help! Why Won't My Cat Poop in the Litter Box? What Do Your Cat's Eye Blinks Really Mean?